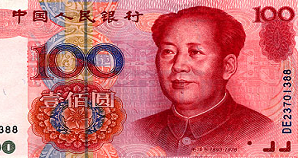 The People's Bank of China announced on May 18 that it would allow the yuan to float within a 0.5% band around a government-imposed exchange rate. For example, if the government-imposed rate were 7.6938 yuan per U.S. dollar, the central bank would allow the exchange rate to fluctuate between 7.6553 and 7.7323 yuan per U.S. dollar. Due to a soaring economy and a widening trade surplus with the United States, the yuan closed at a record high of 7.6686 yuan per U.S. dollar on the first day of the new exchange rate policy. In other words, after the announcement, the yuan strengthened against the U.S. dollar. A "stronger yuan" means that 1 yuan can purchase more U.S. dollars than before. If the exchange rate were 1 yuan per U.S. dollar, yuan holders could obtain $1 for each yuan exchanged. If the exchange rate fell to 0.5 yuan per U.S. dollar, yuan holders could obtain $2 for each yuan exchanged. Hence, the yuan gets stronger as its exchange rate falls, and is stronger at 7.6686 than at 7.7323 yuan per U.S. dollar. The stronger yuan makes Chinese products more expensive for Americans, reducing net exports and therefore lowering China's real GDP growth rate. Why would the People's Bank of China want to destroy jobs in its exports sector by favoring a stronger yuan? One popular explanation is that the Chinese government is giving in to U.S. political pressure to strengthen the yuan. A stronger yuan would reduce the U.S. trade deficit with China, boosting American goodwill towards China and avoiding the passage of U.S. restrictions on Chinese imports. There is also an economic explanation for China's new exchange rate policy. Along with China's recent double-digit economic growth comes the prospect of high inflation and economic instability. The standard monetary policy remedy for an overheating economy is higher interest rates. Raising the cost of borrowing reduces overzealous consumption and runaway investment spending. Furthermore, higher interest rates attract more foreign investors, raising foreign demand for Chinese currency, which strengthens the value of the yuan. At the same time, higher interest rates encourage Chinese investors to keep more of their yuan in Chinese assets, leading to a reduction in the supply of yuan, which adds additional upward pressure on the value of the yuan. Therefore, the People's Bank of China faces an economic dilemma. If it wants to tame the roaring economy, it must allow the yuan to strengthen. But if it wants to maintain a fixed exchange rate, it would need to keep the interest rate unchanged. Today, the central bank has chosen economic stability over exchange rate stability. 1. The central bank coupled the exchange rate announcement with a Q&A document for the public. In what ways is the central bank's explanation for widening the exchange rate band similar to our analysis? In what ways is it different? 3. For some time, U.S. policymakers have complained about China's exchange rate policy. How would a weaker U.S. dollar affect American consumers of Chinese products? How would a weaker dollar affect American producers who compete with Chinese producers? How would a weaker dollar affect Chinese consumers of American products and American firms that export goods to China?